"The note cards look fabulous! We love them. Thanks for your attention to detail and for the always quick response." Gift cards are an excellent way to increase sales and brand your goods and services. When you are ready to make the investment, depend on a commercial printer who will deliver the top in quality and service. Magnetic Striping (encoding) compatible with most POS systems. Sequential numbering and QR Codes. Vibrant, commercial grade 4 color process for ideal outcome. Barcoding. This can incorporate a variable data feature as well. Signature Panels. This portion of the card is customized to accept ink. Scratch Off option. Place any information under a scratch off to increase customer involvement. Embossing can be incorporated as raised numbers or any special feature. Foil Stamping to add visual appeal. Color or clear plastic options, including black core materials. 18 mil to 60 mil PVC, Teslin available. Custom finishing options: High Gloss, Matte, and Frost. We accept most artwork formats from Quark to Adobe with a minimum dpi of 300. We also offer fulfillment services including assembly, affixing and mailing. Custom gift cards can be complimented with custom packaging as carriers and sleeves that further brand your company in the market place. We offer tip-on (glue-on) services. This places a small amount of easily removable, non-damaging glue to a base postcard that the gift card is attached to. We can also place the cards inside small gift card sleeves. Gift card holder packaging increases the presentation of, and engagement with your custom gift card. In today's competitive economy, consumers expect companies to provide a gift card option. The benefit of custom gift cards can be realized by even the smallest of businesses. They increase your reach, allowing you to gain new customers that would not have come to you without receiving the gift card. They build customer loyalty through convenience and service. They are an excellent item to include in your direct mail pieces. A card with your $5.00 gift has more punch than a simple $5.00 off coupon. They build organic word-of-mouth marketing channels. They can be encoded for tracking and be used as loyalty cards. They serve as a cost effective way to encourage ongoing visits to your store; on average 80% of the balance on each gift card will be redeemed. The majority of gift cards that are fully redeemed are done so with a purchase beyond the value of the card. They provide an excellent way to communicate your message and brand. They can be displayed at the register as an upsell item. If you are exploring offering gift cards for the first time, contact one of our experienced experts who are equipped with the knowledge to get your program started on the right foot. We will help you through the process, ensuring the order is tailored to your specific needs. If you have a gift card program in place and are looking for better quality and value, we are your source. You can also price and order basic plastic cards here. 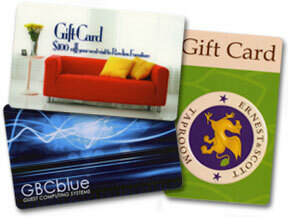 Contact us today for the highest quality in gift card printing, 800-­930-2423.